Pinehurst No. 2 Renovation – the wave of the future or cute little story? 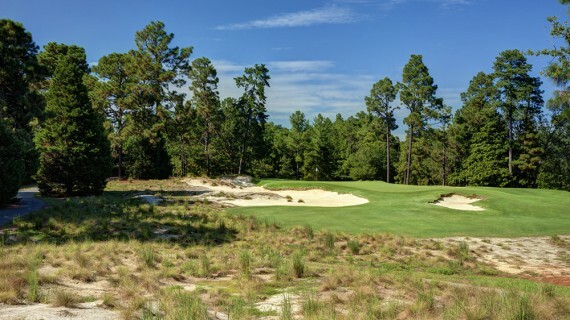 By removing 40+ acres of turf from the rough and restoring the “native areas” of North Carolina’s sand hills, Pinehurst No. 2 doesn’t look like most American golf courses. (Courtesy Pinehurst website). Martin Kaymer probably still hasn’t awoken from the dream that was his 2014 U.S. Open performance. Who could blame him? That was the most effortless major performance probably since Rory at Congressional or Tiger at Pebble Beach. As impressive as Kaymer’s performance was, the undoubted star of the week was the renovated Pinehurst No. 2 golf course. 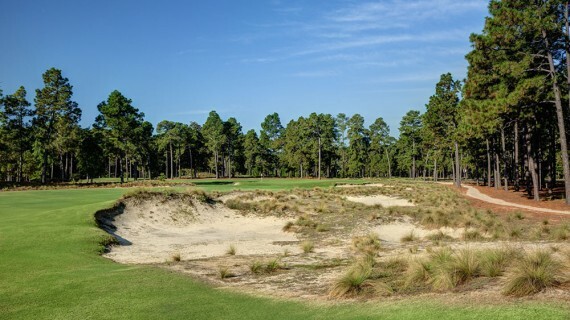 The design team of Coore & Crenshaw have gone to amazing lengths to restore the course to its former glory from the age when Donald Ross was habitually tinkering with the Village of Pinehurst’s crown jewel. From everything I heard on the U.S. Open telecasts or read online during and following the tournament, the renovated No. 2 course received almost universally rave reviews. 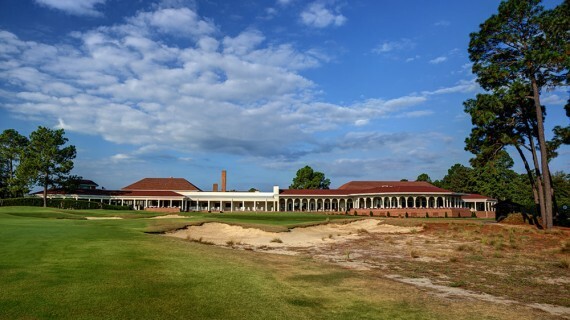 The ragged, non-uniform look of the new-old Pinehurst No. 2 might be a superintendent’s dream, but will average hackers accept it? 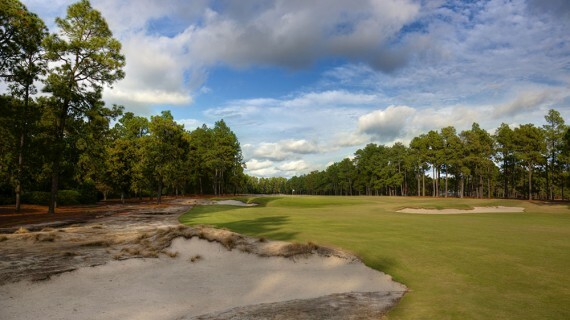 (Courtesy Pinehurst website). I feel like a larger discussion at golf management offices, ASCGA conferences, golf media water coolers, and maintenance sheds across the United States have been leading to this exact moment for several years. The emphasis on environmental sustainability and lowering golf course maintenance budgets has moved from the theoretical and aspirational to mission critical in the space of just a few years. Sure, Pinehurst No. 2 will thrive and continue to receive rave reviews from avid golfers and historians of the game. The sand hills region of North Carolina is a rare inland American golfing nirvana. There is something refreshing in Pinehurst’s return to nature juxtaposed with the luxurious clubhouse. (Courtesy Pinehurst website). And it’s not alone. Whistling Straights and Bandon Dunes have similarly rugged looks and, by all accounts, are a couple of the top modern golf course destinations in the United States. However, if the course wasn’t steeped in more than 100 years of history, if the flags and scorecards didn’t read “Pinehurst No. 2,” but instead read “Moore County Municipal Golf Course,” would the renovated course be so universally loved? The better angels on my shoulder certainly hope so, but my more cynical demons on my other shoulder are skeptical at best. Why couldn’t waste bunkers and native grasses be the future of golf course conditions en mass? The golfing world sees images like this every April, reminding us of what a golf course could be. Because it doesn’t look like Augusta National, and that is a problem for a large percentage of American golfers. 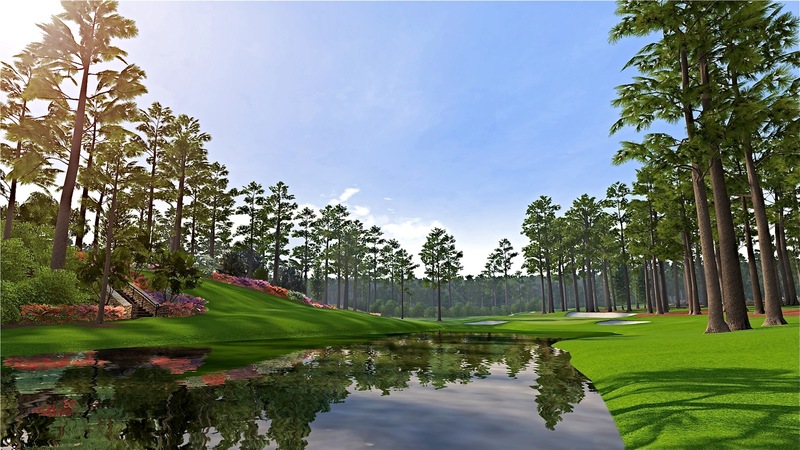 For more than a few generations, Augusta National Golf Club has been the standard against which greens committees, country club members, avid golfers, and television viewers have measured the golf courses they see or play at home. Fair or not, those perfectly manicured grounds, lush green grasses, and sculpted white sand bunkers at Augusta National have imprinted powerful images of what a golf course can and should be in the United States in golfers’ collective consciousness. I don’t single out Augusta National to lay blame at the foot of its members. 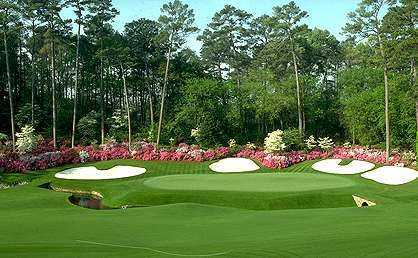 However, Augusta National is probably one of the two most famous, most recognized golf courses in the world (The Royal & Ancient Golf Club of St. Andrews is arguably more famous). It gets a close-up chance to show off every spring. Who wouldn’t want to experience golf surrounded by such stunning beauty? But such beauty comes at a steep price. For golf clubs that have seven-figure-plus maintenance budgets, Augusta National very well may be an admirable goal, a standard of excellence to strive towards. Nonetheless, for a host of reasons, expecting to experience Augusta-like course conditions during each golf round simply isn’t realistic or intelligent. The reasons why courses that look like the renovated Pinehurst No. 2 should be the wave of the future are many. Courses incorporating more natural grasses will be more environmentally friendly, requiring less water and fewer chemical applications. Exchanging waste bunkers and “natural areas” means less mowing and maintenance, helping to boost the bottom line across an overbuilt industry that, frankly, is suffering right now. 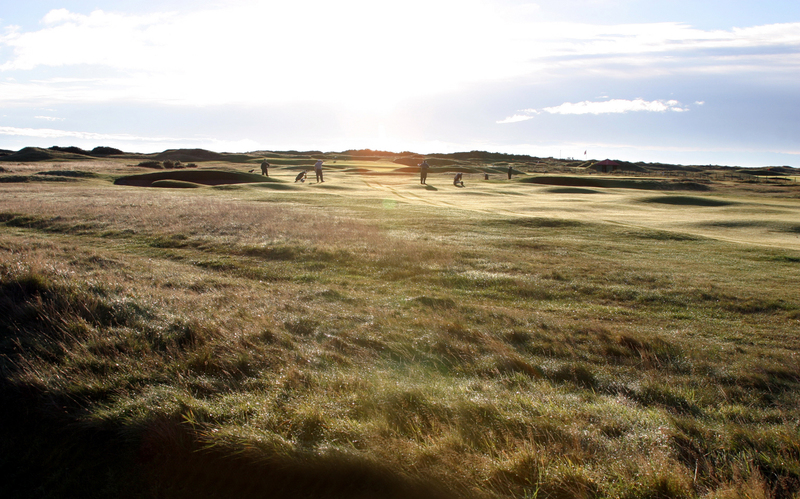 Could the natural beauty of the grasses surrounding Carnoustie ever really rise above a novelty in the United States? That would be a lot of rough that no longer gets mowed. (Photo courtesy Carnoustie Golf Links). The downside is that these golf courses will look a lot more like Carnoustie and Muirfield than Oakmont and Muirfield Village. Perfectly healthy fairways that are varying shades of brown and maize are largely foreign to American golfers and television viewers. Knee high heather is something we expect to see on television when we tune into the final round of the Open Championship across the pond. Sure, British and Irish golfers have literally been accustomed to brown grasses and shaggy, native grass rough for centuries. But until very recently, that kind of golf course has been a far away novelty reserved for one week in July each summer. And therein lies the rub: will Americans embrace a fundamental shift in their expectations of what a golf course should look like? Maybe this could be the future of American golf, but it’s not going to happen anytime soon. (Courtesy Pinehurst website). I hope so, but I’m skeptical. Can the American golf industry see far enough into the future, and abandon its penny-wise, pound-foolish history, so that movement away from perfectly manicured grounds could actually profitable for the game and golf course operators in the long-term? And more importantly, can it convince its customers that it’s something they really want too? I believe it’s going to take a lot louder cheerleading than what Pinehurst No. 2 produced last week for either of those things to be possible. Great Article! I personally like the incorporation of natural surroundings into the course. I think it adds character. Plus, it makes the game of golf a little more challenging and that is a good thing. I certainly wouldn’t advocate for boring. But overall I’m interested to see if more courses start letting their rough “go back to nature” the way Pinehurst did in hope of saving some money long term. Ho-hum or not, I’m jealous you got to play it.